I'm fond of E. O. Wilson's notion of "biophilia"--the deep attraction we have toward living things. The fact that we are biophiles is one good reason we ought to preserve the biological diversity of the planet. But (I wonder) ... am I a true biophile? Here on the Big Island of Hawaii, it turns out the answer is "yes and no." 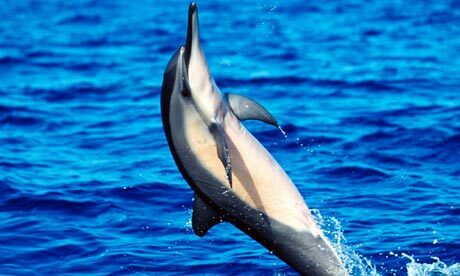 Yes to loving the spinner dolphins we consorted with in kayaks a few days ago, but no to loving the sea urchin I stepped on as I was getting out of the kayak. A big yes to loving the big sea turtles we saw crawling up onto a black sand beach on the southern end of the island. But I am having a big problem loving the coqui frog. The males have a very loud mating call they repeat starting at dusk, continuing way past midnight. It's an eerie, minor key two-note melody that only a girl frog could love. Maybe, though, I have an excuse. Environmentalists distinguish indigenous animals from exotics, and these guys are definitely exotic. Apparently they hitched a ride on a boat or plane from Puerto Rico some years ago. The Puerto Ricans really like them, but here they sing much louder, fit badly into the local ecosystem, and are treated as pests. I could maybe be on their side, if they didn't sound so macabre and desperate. I'm not such a purist myself. The mongoose is an exotic, brought in somewhere else to kill the local rats. they look like stretched out rats themselves--a bit like ferrets--but they're downright appealing. Not so appealing is some respectably local plant that fills the air around Hilo with a pungent skunk-onion smell, especially when it's raining or windy. Where's my biophilia when I need it? Today's goal--figure out what it is. So far, my attempts to find out have been met with vacant stares. "Those wacky tourists from the mainland!" OK, I'm a fair weather biophile. But I wonder--is it even really "bio" that we all "phile"? Last night we trekked down to a spot where a flow of lava meets the sea...us and several hundred other volocano-lovers clutching flashlights in the rain. Earth. Air. Fire. Water. Really cool! Well, biophiles can also be geophiles. There's no reason for the nature lover to be exclusive. But I wonder if "bio" is really inherently more lovable than "geo"--as Wilson's biophilia hypothesis seems to suggest. 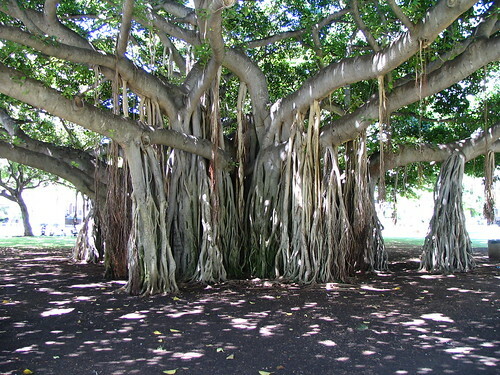 Today we shall make a close study of the banyan tree, aptly described as "grotesquely beautiful" by my son. A true biophile would probably leave out the "grotesque" and just say "beautiful." We shall see. I'm not big on rats myself. I wonder what Mr. Wilson's biophilia would do if he found rats in his basement. Can you know if you believe in God?